Cleaning out our CES bags is like that Family Ties two-parter where they dig through the attic: it takes too long, but we remember some good stuff that would have otherwise been repressed forgotten, like the Sunwave SRC-3200 Universal Remote. 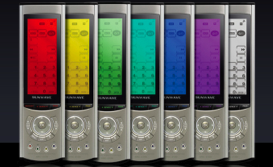 Featuring 8-in-1 compatibility, along with an LCD touchscreen button layout, the Sunwave appears to be your standard, (nice) universal remote. But when switching between devices, the backlight color changes, easily identifying which device you are controlling. During our hands-on, we were impressed by the fluid interface, but hoping that the backlight appeared brighter in the romantic dimness of our home theaters. Oh, and what's with the 7 colors for our 8 devices? Poor VHS, shafted again. Product Page (sorry, no clue what it costs).